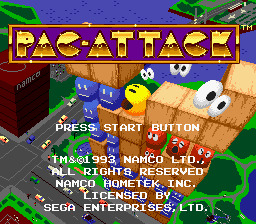 Pac-Attack is a puzzle game somewhat similar to Tetris. Basically Pac-Man is ghost hunting once again, not gobbling pellets this time but concentrating on wiping out his enemies. Your job is to set up the bricks so that they make complete lines which are eliminated, and also set up the ghosts so that when Pac-Man drops in he eats as many as possible. Pac-Attack has really good graphics for a simple puzzle game. I guess the only disappointment is that all the ghosts are the same. But then, if they were supposed to be the original Pac-Man ghosts, I guess you could only have four at a time. Rotate the pieces as they fall, to set them up the way you want. Each piece contains three squares, which can be a brick, a ghost or a Pac-Man. The pieces aren't solid, meaning that everything falls to the lowest point possible. The bricks can be eliminated by forming a solid line just like in Tetris. The ghosts all turn blue when Pac-Man drops in, so he can eat them. Pac-Man will follow the path of least resistance down the screen, so the trick is to put the ghosts where he will be able to get them all before he hits bottom.